Two reasons to be pleased with the day. For starters, the sailing has been grand. I poled out the twin headsails about midnight last night and didn’t touch them until a hour before sunset today. I know that my friend Eric Moe desperately wants me to fly the spinnaker while we’re in the south (“Give puffy a chance,” were his words), and I know that the Commodore would also prefer the spinnaker because it isn’t prone to making the boat roll, but the twins poled out are set-and-forget. And for a guy who’s done nothing but haul a line for the last three days, the “forget” part of that equation is grand. 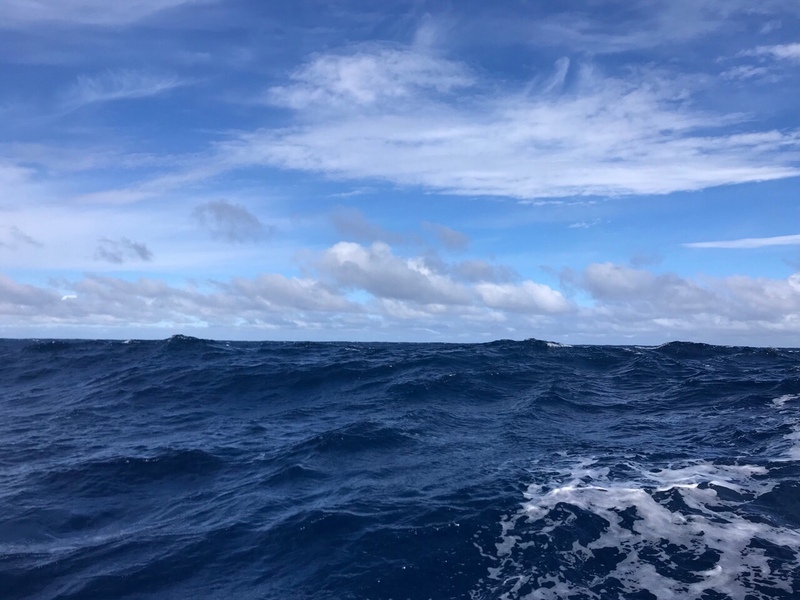 It also doesn’t hurt that we’ve been frothing a deep blue sea under pale blue skies with (ok, I’ll admit) a number of squalls. But today the squalls carried no punch, and after the first three, I stopped watching for them. The second reason to be pleased is that I got important maintenance work done on Monte. The folks at Scanmar recommend replacing the Monitor’s plastic parts about every 15,000 miles (think San Francisco to New Zealand and back). Well, we blew by that number a month and a half ago, and still Monte is minding the tiller all day every day. The effect of all these extra miles is that he’s gotten a bit loose in the knees–functional, but not quite his peppy self. As these next few weeks are critical, and very tough winds, likely, I took the opportunity of a gentle day to give my friend a little make-over. 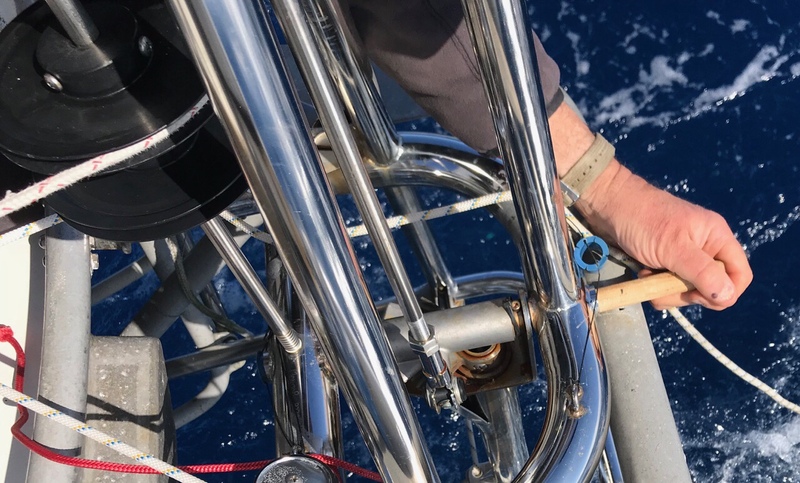 By “loose in the knees” I mean that the bushings and bearings in the actuator arm and around the watervane support shaft have worn, causing play in the system and a worrying rattle. 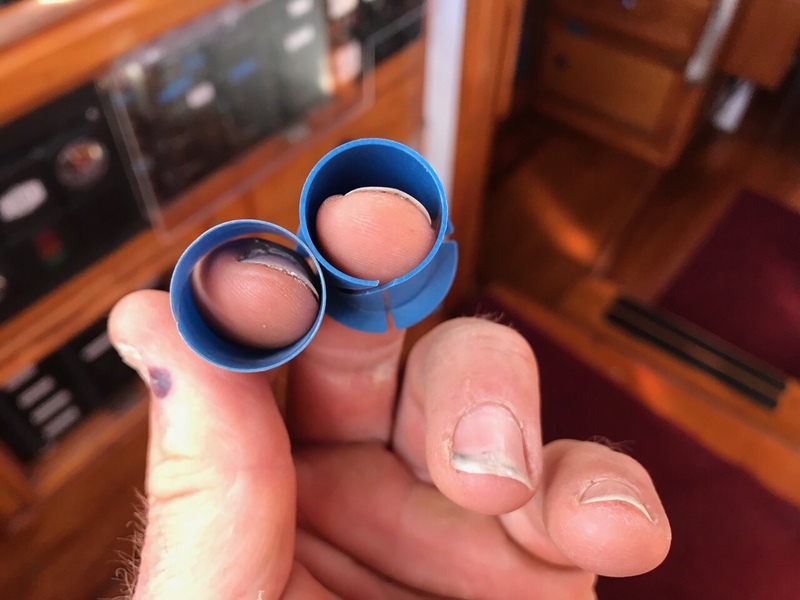 Replacing them is no big deal…except when one is hanging over the stern on a boat in a seaway. Drop it, whatever it my be, and it’s gone forever. 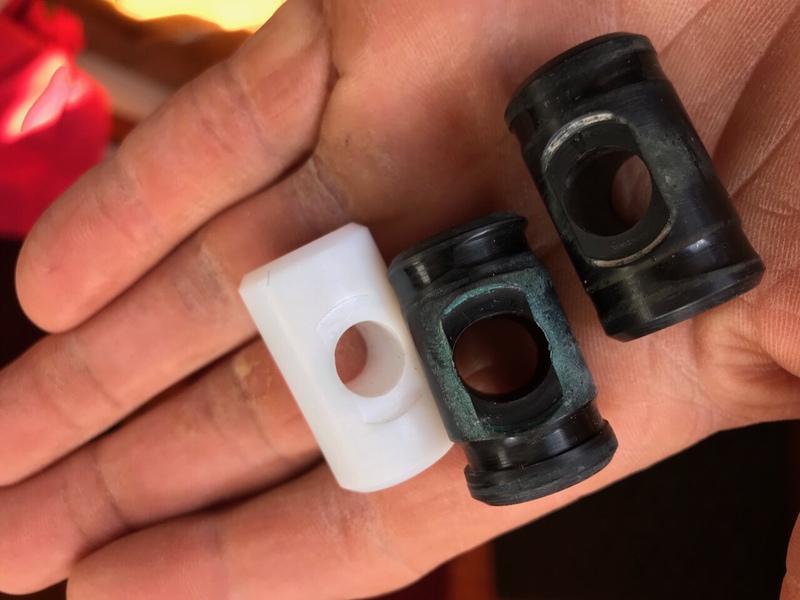 The challenge to the first job is that the black bushings of the actuator assembly are held in place by tiny bronze retainer rings. One false move on the part of the installer and they are likely to claim their freedom, however brief it may be. The second job, inserting new bushings around the watervane support shaft, is equally delicate. This one is best done with Monte engaged and requires one push the shaft (a 1-inch stainless steel rod) slightly forward in order to dig out the worn bushing. 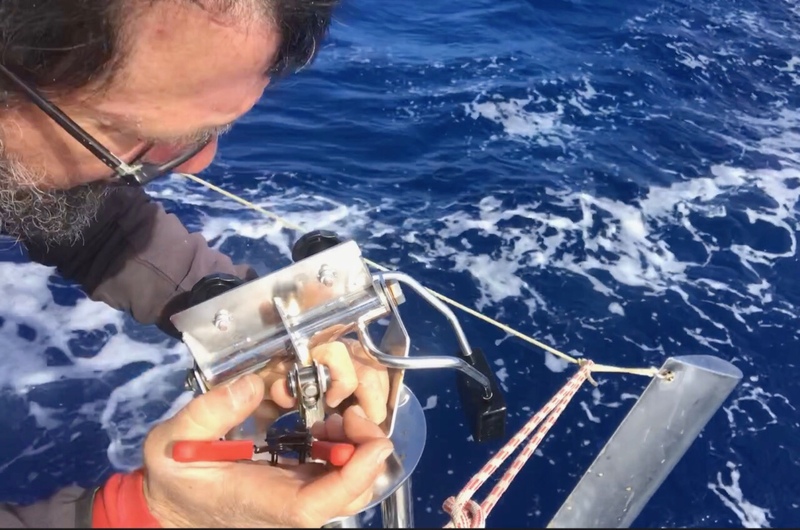 This shaft is the heart of the Monitor system, and the false move here could actually spill the shaft, all its many bearings, and the gears into the drink–a bracing image when one is in the middle of nowhere. Both jobs successful. And Monte is Senior Esmoove and Esuave once again. Well done, I was holding my breath even as you described it! I did something like that when planning down the River Crouch & saw the starboard shroud had lost the anchor pin, I crawl up to the forestry & borrowed that one just before we Gybed, Only for the young ! Good to hear Monte has his sea legs again, we wouldn’t want him going on a rant and rattling away! I’m with you spinnaker is a pain to almost impossible alone. Sounds like the poles are getting a work out. Great photos thanks. Well done, senor!! Monte must feel like a kid again! But wow, look at those bearings! Glad the sea didn’t need any spare parts! Newbie here! I just spent several hours reading through all of your posts since you started. I’m one of those crazy fountain pen nuts that Nick Stewart referred. Your mission has peaked my interest. All I can say is “Go for it! We are with you in spirit! You are amazing!” Know that some of us are offering up prayers of thanksgiving and protection for you and Moli – Monte as well! Whew! I broke out in a cold sweat reading about that job. You obviously don’t have as many thumbs as I do! Good job! So weird. I find myself asking what did you do for your day today. Meantime, I’m living mine, going thru my own things. I think I’ve been following your life more closely than anyone I know who I don’t live with (my wife) including my own children and grand kids. I’m certainly rooting for your success, every day. You had my stomach in a knot during that post…knew you hadn’t dropped anything since you started with it being a good day. But still, I was worried thinking about all the times I’d admonished myself not to drop something in the drink and then I’d gone ahead a dropped it anyway. Good work sir.